Trends Audio delivers USB audio converter for PC/Mac | What Hi-Fi? Inside there's a Tripath proprietary Class-T digital processor and Trends' own circuitry and component design. 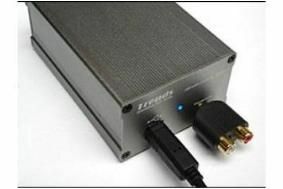 The machine operates as an external soundcard, complete with various digital outputs and a headphone out – meaning you can use it as a USB DAC, headphone amp or a digital interface for connecting to your DAC. The idea behind the device is not only to give your digital tunes access to high-end audio components but also to greatly limit the interference from within your computer – power supply, fan motors – harming your music.